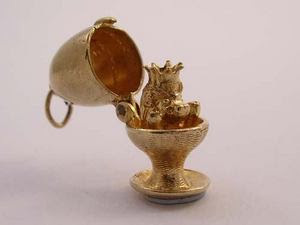 I am always enchanted by vintage charms that open up to reveal adorable contents. Above is another one, which according to the seller is circa 1970. 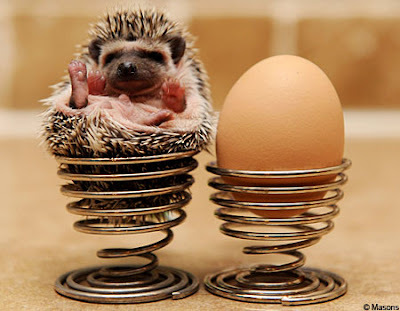 I sadly can't explain why the little 9K hedgehog is wearing a crown, and moreover is sitting in an eggshell. These mysteries aside, it bears an uncanny similarity to a recent photo from one of the UK's most distinguished news journals of an actual pygmy hedgehog, so wee it too will fit into an eggcup. The real hedgehogs, which are currently popular as household pets, will run you £200. The charm is about half that, and housebroken.